Minimum wage protests: What sparked them, and can they work? STATEside asked Distinguished Professor of Management and Quantitative Methods Victor Devinatz to shed some light on why the workers are taking to the streets. The College of Business faculty member is author of High-Tech Betrayal: Working and Organizing on the Shop Floor, and he teaches courses on U.S. labor history, union organizing, and current labor events. The Q&A with Devinatz is part of an ongoing STATEside series called Office Hours, featuring timely analysis from Illinois State faculty about today’s news. What sparked the minimum wage protests? The protests are a continuation of the strikes that began over a year ago in New York City. During spring 2013, the one-day strikes spread to Chicago, Detroit, St. Louis, and Seattle, and in August fast-food workers struck in 60 cities throughout the U.S. The current protests are being sparked because fast-food workers are unable to survive on the wages that they are being paid. Almost 90 percent of the 4 million fast-food employees in the U.S. are front-line workers whose median hourly wage is $8.94. The wages in these jobs are so low that 52 percent of the families of these employees depend on various public assistance programs. Even after working for several years in the industry, front-line workers often obtain minimal wage increases. Additionally, fast-food workers lack benefits and most work part-time hours—less than 32 hours per week. Finally, many of these employees have little opportunity to move to jobs that pay better wages due to higher unemployment rates affecting most of the U.S. since the onset of the 2008 financial crisis. Many workers are demanding an increase to $15 an hour. Why that amount? 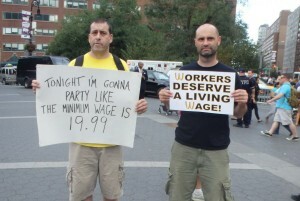 The demand for $15 an hour is symbolic. While there is no specific reason that $15 an hour was chosen, this figure represents what could be considered to be a living wage in many parts of the country. The figure was likely chosen to illustrate how poorly fast-food workers are paid and that one person, much less a small family, cannot survive on such low wages. How does the public’s perception of an average fast-food worker square with reality? While many believe that teenagers and college students make up the vast majority of employment in the industry, two-thirds of front-line employees in the fast-food industry are adults over age 20. Moreover, 68 percent of these fast-food workers are their families’ primary wage earners. The average age of workers in fast food is 28, with women (primarily those of color) comprising 66 percent of industry employees. Women working in the industry have an average age of 32, with many supporting children on their meager wages. Some say the increase in minimum wage will force businesses to automate more of their process, putting workers out of business. Is there a precedent for that argument? It is certainly possible that business owners could turn to automation in the fast-food industry even if there is not an increase in wages. However, the implementation of automation will not happen immediately. The number of workers that would lose their jobs depends on the specific automation that would be installed. Automation has been implemented in sushi restaurants in Japan while McDonald’s has stated that it plans to install touch-screen ordering systems at 7,000 of its locations in Europe. In spite of these developments, the Bureau of Labor Statistics considers food preparation to be one of the four fastest-growing occupations in the U.S. and predicts that the fast-food industry will keep generating a significant number of jobs at least through 2018. What could be the impact of these protests? These protests, in and of themselves, will probably not lead to the achievement of significant gains for most fast-food employees. However, in Chicago, for example, the April 2013 fast-food strikes, which included retail workers, led Whole Foods in East Lakeview to increase its employees’ wages by $2 an hour. These protests, nevertheless, continue to publicize the plight of fast-food workers and also demonstrate the harmful effects of exceedingly high levels of economic inequality in the U.S. Moreover, such one-day strikes might encourage more employees in the industry to become involved in the movement by participating in future protests. Such protests will continue to help to build a movement of low-wage workers in their fight for achieving higher wages, better working conditions, and dignity in the work place.